As you read this, our elected state representatives and senators will be trekking to Tallahassee to begin the 2017 Florida Legislative Session. Florida’s lawmakers are only in full session for 60 days, from March 7th through May 5th, 2017. Our elected lawmakers convene at the state capitol in Tallahassee to review and debate thousands of bills, and then send a few of them to the governor’s desk. You may already know what estoppel means, but let’s take a moment to re-view. An estoppel is a critical and legally binding document protecting potential homebuyers by disclosing liens, overdue fees, and other money owed to your association. 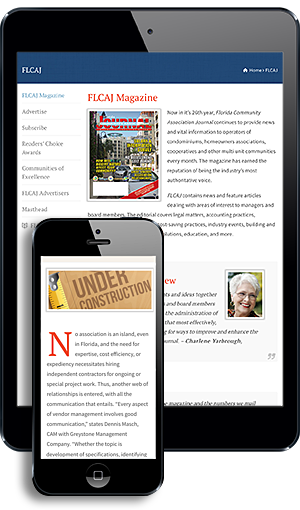 In a standard real estate transaction, community associations are required to provide buyers and sellers with this financial and legally-binding information. If it’s wrong, the association may lose assessments—and worse, it could be responsible for substantial attorney’s fees, so it better be perfect! Estoppels are prepared by homeowners associations or their agents, and they cost associations time and money to prepare. The estoppel doesn’t simply appear by “just pushing a button” as lobbyists argue and some lawmakers believe—there are real costs, time, and liability to your association, and real consequences for information that is wrong or incomplete. You might think the estoppel is the major part of any real estate deal with all the legislative attention received in recent years, but it’s not. 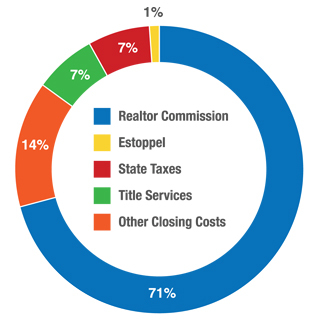 In fact, estoppel fees are dead last when compared to all other real estate charges—just one percent of most real estate transactions. Compare this to the whopping 78 percent that realtor commissions and title services make up. So, it makes you wonder, who exactly keeps pushing for these new laws shifting the burden from an individual buyer/seller to your association? You’re right to ask. Since the housing recovery began, realtor and title company profits have re-bounded to record levels. Good for them. But they decided record profits of nearly 80 cents on the dollar aren’t enough, so title companies and realtors decided to go after miniscule—to them but not to associations—estoppel fees. Under past laws and the newly proposed laws, homeowner, townhome, and condominium associations will lose rights to collect money owed associations. For example, communities will lose the right to recover and collect unpaid fees and assessments if an estoppel is not provided by a date certain. Currently, associations have a right to lien in an effort to recover what is owed to the association. If one chooses to live in an association, one agrees to fairly share costs. A loss of these historic legal rights would lead to, in many cases, significantly higher fees and assessments being placed on those already paying and (sometimes) struggling to pay for someone else’s delinquent costs. “Pay at closing”: Instead of paying for an estoppel when the service is rendered, like every other transaction, homeowner associations will be forced, by law, to pre-pay closing costs for real estate transactions where the association is not even a party! What happens if the sale doesn’t close, for any reason? You—the association, managers, and homeowners—must pay the costs of the estoppel’s preparation through higher fees and assessments. You wouldn’t hire someone to cut your lawn but only pay them if your home sells, and it is doubtful anyone would agree to cut your lawn on the basis of such an arbitrary contingency. Estoppel requests are the same exact thing. Price-Fixing: Every single estoppel is different and unique, depending on what liens, fees, ownership (is it bank owned? ), and other costs are associated with the home, condominium, and townhome. Preparing a legally binding estoppel takes time, precision, and money, but realtors and title companies want to arbitra-rily cap (price-fix) what your association may charge (usually the seller) for preparing these estoppels. Guess what happens when the costs for preparing an estoppel exceeds the arbitrary cap? You guessed it. Associations, in many cases, have to assess higher fees on everyone else in the association to pay for these individual home sales. Let’s be clear: this new estoppel bill changes the purpose of a legal document designed to protect homeowners into a tax increase. These bad bills are simply a new “home tax.” It’s not right. Homeowners: Homeowners could see increased association fees, in the range of 10–20 percent on the low end and more than 30 percent on the high end. Associations: Associations and their business partners will be forced to take valuable time away from important homeowner needs to prepare a much more complicated and time-consuming estoppel. Even worse, your association faces a likelihood they will not be reimbursed for legal and other fees to prepare the estoppel if a home does not sell. Managers: With capped fees, a shorter time to prepare estoppels, more re-quired legal pitfalls, and unpaid estoppels due to failed closings, managers will find themselves with less time and less money to do more work with increased legal liability. Once the estoppel is prepared, you’re stuck. Thanks to you, the work of groups like Community Association Network, Space Coast Communities Association, CEOMC, and excellent professional advocacy, we have successfully defeated the home tax in 2015 and 2016. Now, however, the home tax is back for anot-her bite at the apple in 2017. Senator Kathleen Passidomo has filed Senate Bill 398, a “greatest hit’s” list of all of the home tax’s aforementioned worst ideas. Rep. Byron Donalds has filed the identical House Bill 483. Here’s the good news: despite the well-funded influence of powerful special interest groups like title companies and realtors, lawmakers still listen to their constituents, which is exactly why this legislation has thankfully been defeated the last two years. We will again need you to speak up loudly against the home tax. • Visit www.SmashTheHomeTax.com to personally e-mail your state representative and state senator. Enter your home address or click the “locate me” button. • Please don’t raise my association fees. Vote No on the home tax and SB 398 and HB 483. • Please do not support the home tax. Vote No on SB 398 and HB 483. • Our community association cannot afford SB 398 and HB 483, the home tax. • Support your homeowners. Oppose SB 398 and HB 483, the home tax. • Hit send. You’re done! Defeating the home tax for a third straight year will take everyone—homeowners, association board members, and managers—speaking with one powerful voice. Special interests have spent millions to line their pockets with more profits at our expense. But together, we will estoppel them in their tracks, once again. Alan Garfinkel has counseled homeowners, townhomes, condominium associations, and individuals throughout Florida from his same Central Florida office for 25 years. He continues to passionately work for those living and working for community associations. Garfinkel received the highest ethics rating (AV) for more than a dozen consecutive years. Attorney peer review ratings provide objective grades based on confidential evaluations by attorneys and judges measuring a lawyer’s ethical standards and legal ability. Garfinkel Whynot only represents community associations not big corporations that can develop conflicts with communities like developers, banks, and insurance companies. For more information, visit www.MyGWLaw.com.